_If a camera didn't compensate for the bright sunlight in space, stars would be seen in the background and the Earth would appear as a bright white orb. Because distant stars aren't as bright as the Earth, a low photo exposure results in a black background. _Artist's concept of the magnetosphere. The rounded, bullet-like shape represents the bow shock as the magnetosphere confronts solar winds. The area represented in gray, between the magnetosphere and the bow shock, is called the magnetopause. The Earth's magnetosphere extends about 10 Earth radii toward the Sun and perhaps similar distances outward on the flanks The magnetotail is thought to extend as far as 1,000 Earth radii away from the Sun. Space Plasma Physics - research on plasma at NASA's Marshall Space Flight Center. Earth's Solar Environment - International Space Physics Educational Consortium. Exploration of the Earth's Magnetosphere - overview of NASA research on the Earth's environment in space. 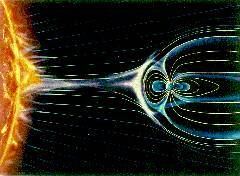 _Artist's concept of the interaction between the magnetosphere and the Sun. The Earth's magnetic field provides a barrier to the solar wind. _Sept. 7, 1999: As photographed from space, the Earth looks like it is floating in a black void. But, unseen by our eyes and most cameras, the Earth is actually surrounded by a complex system of interacting electric and magnetic fields, electric currents and charged particles called the magnetosphere. The magnetosphere provides a barrier between our planet and particles continually given off by the Sun's corona called the 'solar wind'. These particles constitute a plasma - a mixture of electrons (negatively charged) and ions (atoms that have lost electrons, resulting in a positive electric charge). Plasma is not a gas, liquid or solid - it is the fourth state of matter. Plasma often behaves like a gas, except that it conducts electricity and is affected by magnetic fields. On an astronomical scale, plasma is common. The Sun is composed of plasma, fire is plasma, fluorescent and neon lights contain plasma. "99.9 percent of the Universe is made up of plasma." says Dr. Dennis Gallagher, a plasma physicist at NASA's Marshall Space Flight Center. "Very little material in space is made of rock like the Earth." The plasma of the magnetosphere has many different levels of temperature and concentration. The coldest magnetospheric plasma is most often found in the plasmasphere, a donut-shaped region surrounding the Earth's middle. But plasma from the plasmasphere can be detected throughout the magnetosphere because it gets blown around by electric and magnetic forces. _Gallagher has developed a general model to describe the density of the plasma surrounding the Earth. His paper 'Global Core Plasma Model' will be published in the Journal of Geophysical Research. "Core plasma" refers to the low-energy plasma (zero to 100 electron volts) that makes up the plasmasphere. The plasmasphere extends out to as little as 2 to 3 Earth radii and, under quiet conditions on the evening side, perhaps more than 6 Earth radii. (Because conditions in space constantly vary and regions never have exact boundaries, plasma physicists measure the plasmasphere relative to the size of Earth: 4,000 miles [6,400 km] is about one Earth radius.) The extent of the plasmasphere depends on space weather activity. High levels of activity erode the plasmasphere, long periods of quiet allow the plasmasphere to expand. Rockets, satellites and the space shuttle have flown in parts of the core plasma neighborhood. By taking various measurements of this region, scientists have gradually come to understand the basic nature of the entire plasmasphere. "We've been flying in plasma for over 40 years and have slowly gained a statistical picture of what things are like, such as the density and proportion of oxygen, hydrogen and helium," says Gallagher. But our understanding of the plasmasphere is not complete. For one thing, all the various measurements have resulted in many independent models of specific plasma regions. By combining previous work, Gallagher's model attempts to describe, mathematically, a general, complete image of the plasmasphere. "This model begins to paint a picture, but it's something of a Frankenstein's monster." says Gallagher, referring to how his model is pieced together from several different, dissimilar models. "A significant issue is how you smooth the stitches." Gallagher's model combines the International Reference Ionosphere (IRI) model for low altitudes with higher altitude models. The part of our atmosphere that contains plasma - the ionosphere - is generally 90 to 1,000 km (54-620 mi.) above the ground. The shorter wavelengths of sunlight, ranging from the ultraviolet to X-rays, ionize the Earth's upper atmosphere by tearing electrons off atoms. The ions and electrons do not readily recombine in the ionosphere because particle collisions are infrequent in the rarified atmosphere. Ionospheric densities range from a peak of about 1 million particles/cm3 down to many thousands of particles/cm3. The densities continue to fall as you move to higher altitudes. From the equator to the middle latitudes of Earth, the ionosphere joins smoothly with the plasmasphere. Beyond the outer boundary of the plasmasphere, the densities of plasma in the magnetosphere can fall as low as 0.01 particles/cm3. "The plasma environment around the Earth is a natural extension of Earth's atmosphere, ionized by the Sun." says Gallagher. "Any planet that has an atmosphere is going to have energy from the Sun imparted to the atoms. The consequences are that lighter elements escape. But Earth's magnetic field traps much of this escaping gas. A planet like Mars that has, at best, a weak magnetic field, also has a very thin atmosphere. Some researchers have speculated that the Earth's magnetic field may play a role in slowing the loss of our atmosphere into space." Our atmosphere provides pressure, proper temperature and oxygen - fundamental requirements for life on Earth. Without the atmosphere, one side of our planet would freeze while the other would broil under intense solar radiation. Gallagher's model may contribute to our understanding of how the Earth's plasma affects our quality of life. Radio waves and power lines are affected by the presence of plasma, as are satellites and the Space Shuttle. Plasma can cause an electric charge to accumulate on one part of a spacecraft but not another, sometimes resulting in an electric arc, or discharge. These electric arcs can disrupt or destroy sensitive electronic components. Gallagher will be able to refine his model with data from the IMAGE satellite (launched in February 2000). IMAGE will give us a better picture of the Earth's magnetosphere, and because plasma is bound to magnetic fields, IMAGE should also improve our understanding of how the plasmasphere and the magnetosphere interact. SwRI space scientists developed a technique to predict phenomena that can affect Global Positioning and other satellite systems. _The Earth's magnetic field forms a region in space called the magnetosphere, shown here by yellow lines.The magnetosphere gets deformed by a constant wind that blows from the Sun so that it is squashed up on the side facing the Sun, and dragged out on the side facing away from the Sun. The magnetosphere is not an empty region but instead contains high energy charged particles! These particles group together in different regions, trapped by the magnetic field. The Cluster satellites are flying through these regions with trapped particles, studying what they are, how the change over time and how they effect us here on Earth. The region shown in blue indicates what is known as the plasmasphere; a very cold (58,000C!) and dense region of charged particles. The region in green shows the location of the plasma sheet. A warm and less dense charged particle region. The yellow region indicates the region known as the ring current and the orange region the radiation belts in which many of our satellites orbit.